In their everyday decision processes, humans depend on their ability to evaluate the suitability of environmental objects for specific actions. Suitability can therefore be understood as an abstract quality that is determined by properties of both the human agent and the environment as well as the action to be performed. The notion of such mutual dependency relationships with regards to action potentials is closely related to the concept of affordances as proposed by Gibson (1977). 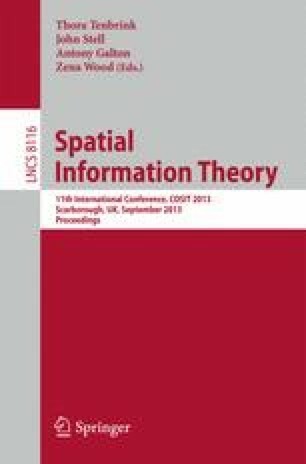 In this paper, a conceptual framework is proposed for the simulation of human agents assessing spatial suitability. In our model, actions represent a central element and are modeled at different hierarchical levels of abstraction. Finally, a simulation of pedestrian route choice is presented as a case study in order to explain the assessment process.